A – Arda River: the springs of Arda are situated in Rhodope Mountains, just on the Border with Greece. You can reach it by horseback riding (very popular in this region) or by walking on the cross-Rhodopean enchanting trails. B –Balkan Mountain Range: is a 700km long mountain that has given its name to the whole Balkan Peninsula. There you can enjoy a 20-day E3 trek walking on the main ridge of the mountain which descends right to one of the most popular wild Black Sea beaches (Emine and Irakli). You can also do it by biking, but be ready; it’s going to be tough. If you prefer air rather than earth, then you are on the right spot for the best paragliding in the country. C – Cuisine: Bulgaria will charm you with its exotic tastes and aromas. Situated on the crossroad of Europe and the Orient, Bulgaria has grabbed the best of their culinary traditions. One of the best examples of the local cuisine is banitza (breakfast pastry), shopska salad, gyuveche and musaka. But don’t miss to challenge yourself tasting boza (sweet wheat drink), tarator (yogurt cold soup), and of course, rakia (the local brandy). D – Danube River: The Danube River is the second European longest river. Here you can combine cycling along shore with visits to Medieval Fortresses and Rock Churches. The highlight along the way for all nature lovers is bird-watching in Srebarna Nature Reserve (UNESCO World Heritage). The fabulous Delta isn’t far too (in Romania). E – Eco-paths and trails: Bulgaria offers a great deal of eco-trails perfect for one-day adventures. More than 50 eco-trails around the country attracts with their perfect for the summer heat river pools, nice glades for leisure picnics and easy walks through wooden bridges, rocky valleys and panoramic views. Some of the best examples are: Smolyan Waterfalls in Rodopi and Byala Reka eco-tail in Central Balkan. F – Folklore: apart from being attracted by the many natural beauties of the country, there is no doubt that you will be fascinated by the local traditions and folklore. It is another colorful mixture between western and oriental styles merged into Balkan rhythms and peculiar steps. While relaxing from your exhausting day adventures in any mehana (traditional restaurant) you can easily learn how to dance “horo” (the traditional dance) or simply enjoy the folklore music played by the local bands. The Mystery of Bulgarian voices was among the most outstanding recording of its kind before the fall of the Iron Curtain. In 2006 and 2009 UNESCO has declared the Bistrishki Babi Group and Nestinarstvo fire-dancing rite in the village of Bulgari as a world living cultural heritage! G – Gorges of Bulgaria: by far the most fascinating canyon in the country is the 300-m deep Trigrad Gorge. There you can descent into the “underworld” through “Devil’s Throat cave” as Orpheus did or simply rappel down to the 40-m abyss of Haramiiska cave. H – Horse Riding: Get off the beaten track and discover the best of Bulgaria on horseback. Top destinations for riding are Rila, Rodopi and Balkan Mountains. But the utmost experience is riding a Karakachan horse (a local breed) in Vlahi village with great views to the rugged Pirin Mountains. I – Ice-climbing: Why not trying a new warming up adventure in the heart of Rila National Park? Skakvitsa Waterfall, 80-m high fall gets frozen from December till February and gives you a wonderful opportunity for a different winter experience. If done as a two-day trip it can be combined with a nice hike to the Seven Rila Lakes. J – “ЖП” The Bulgarian Railways: Might be rustic but many times they give you a great perspective of the country, passing through narrow gorges like Iskar River Defile or high mountain passes like Yundola. The trains make good connections with the rest of the Balkan countries: Turkey, Greece, Romania, and Serbia. K – Kukeri Carnival: The country’s best kept pagan tradition for scaring away the evil spirits. It is the local winter version of Halloween J with the only difference that noise is bigger and the costumes heavier (iron bells and sheep fir used for dressing). Kukeri carnival can be well combined with a skiing or snowshoeing holiday in Rila or Pirin Mountains. L – Land of 500 Hot Springs: Bulgaria can offer a great deal of thermal swimming pools, SPA centers, and balneology resorts. Definitely the best combination is winter snow walking and hot waters in Rodopi Mountains, just try it! M – Monasteries and churches: Bulgaria’s image wouldn’t be complete without the 150 well preserved colorful monasteries. Some of them offer comfortable facilities for overnight stays. Rila Monastery is known worldwide, and is the most visited one. In each of three largest Bulgarian monasteries (Rila, Bachkovo and Troyan) are kept miracle icons of the Virgin Mary. Painted churches can be seen in every corner of the country. Must see are the churches in Sofia, Plovdiv, Arbanassi, Ivanovo and Nessebar. O – Orpheus, the Land of Orpheus: thus is known the magical Rhodopi Mountains. If you are looking for wildlife, vast forests, huge lakes and gourmet for your family this is your top destination in Bulgaria. There you can try out kayaking and biking around Beglika Lake or hiking through remote Central Rhodopi villages with pristine views. P – Pagan Roots: Bulgarian culture and customs still contain elements of Bulgaria’s pre-Christian roots. In March famous are the kukeri festivals, which have Thracian roots. The locals dress in animal-like costumes and wear colourful masks. 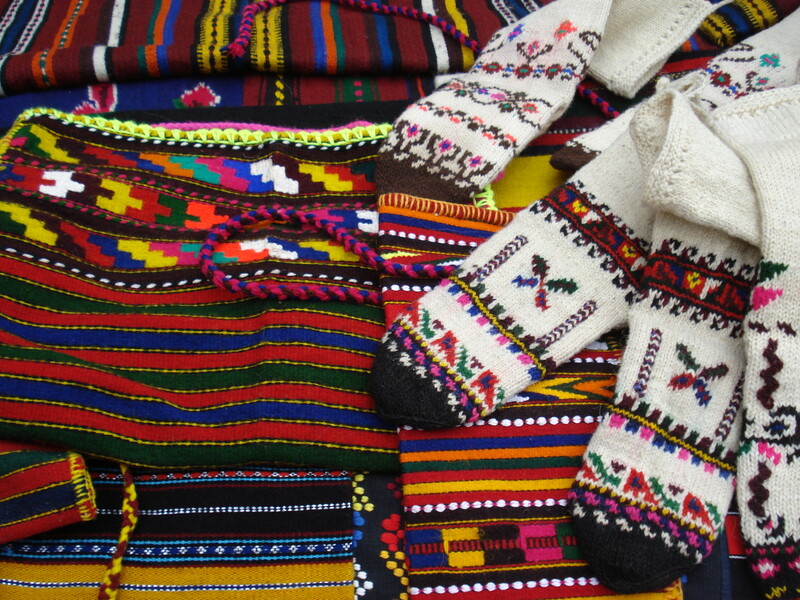 Each March 1st, Bulgarians exchange martenitza, red and white yarn “charms”. They are symbols of the coming spring. In May one can see the nestinari fire dance in South-east Bulgaria. R – Rose oil: Bulgarian scholars presume that Ottoman Turks introduced the cultivation of the Damask Rose on the Balkans. The climate in the area of Kazanlak proved to be more favorable than the one in other parts of the Empire. From then on the region is known as the Valley of Roses. In 17th century after the invention of the double and multiple distillations, Bulgarian rose oil made a name for its superior quality. This essence is exported for the needs of the perfumery industry. S – Strandja Black Sea Coastal Mountains: the most adventurous way to get from Bulgaria to Turkey is definitely by cycling and camping through Strandja Mountains and the Black Sea coastline. The ecosystem of Strandja Mountain (century old forest, flora) is of great value. T – Thracian Civilization: probably you have heard of Orpheus and Spartacus but have you ever got to know that these were Thracian citizens, not Greek ones. Thracians inhabited present-day Bulgaria long before Bulgars and Slavs settled here. They worshiped their gods at specially selected places usually in the mountains. In the past 15 years archaeologists research Thracian sanctuaries all over the country. One of the most adventurous ways to visit the Valley of the Thracian Kings is by cycling along the southern Balkan Mountain footsteps. From village to village you can both enjoy the views to the mountain and learn more about this ancient little know civilization. U – UNESCO Heritage: in a relatively small territory of 111 000 sq km Bulgaria has so many cultural and natural site that it might take you a lifetime to visit all of them. Probably the most impressive ones are the 9 UNESCO sites: The Madara Horseman (the only rock relief from medieval times in Europe); the Kazanlak and Sveshtari Thracian Tombs (from the 4th to the 3rd Century BC); Rila Monastery; Boyana Church near Sofia; Ivanovo Rock Churches (dug out of the limestone cliffs and inhabited until the 17th century); and ancient Nessebar on the Black Sea. UNESCO recognizes also Pirin National Park and Sreburna Biosphere reserve for their incredible biodiversity. V – Village life: lush gardens overflowing with fresh fruits, vegetables, and trellises full of grapes have been part of Bulgarian rural life for centuries. Even most city-dwelling Bulgarians have small village homes where they grow vegetables and fruits, and prepare compote, home-made wine and rakia (Bulgarian grape or plum brandy). Horse or mule-drawn carts are used to transport produce, and people. Village visits can be arranged and guests can stay in pensions or with local families. There is ample opportunity to learn to make yoghurt, preserves or wine, pick local herbs, study woodcarving or weaving. W – Winter Adventures: If you have already been all around Europe on a ski vacation, it is just time to visit winter Bulgaria. You can equally enjoy ski-mountaineering to the Seven Rila Lakes with great views or off-piste skiing and traverse in the vicinities of Bansko area. For those who prefer more relaxed holidays with winter walking and snowshoeing in endless pine forests they should head to Rila and Rodopi Mountains. X–treme White Water: from May to June Struma River is the best place for rafting and K2. One of the few spots in the country where you can also practice canyoning is in the western foots of Pirin Mountains. Y – Yogurt…is Bulgaria’s most famous gastronomic product and it is indeed delicious and smooth as silk. The Thracians were very good at stock breading and produced from milk a number of dairy products. One of them, however, has become worldwide known through its name “yoghurt”. In 1905 the secret of Bulgarian yoghurt was revealed, namely a special bacteria Lactobacillus Bulgaricus , which became one of the symbols of the country. There are different types of yoghurt: cow’s, sheep’s, goat’s, buffalo’s and mixed. They are used for the preparation of various healthy meals such as tarator, banitsa, ajrian. Z – Zagrei, the God of Wine: Bulgaria has a 4000-year tradition in wine production, and some of the aged red wines are among the best in the world. The climate and specific sole provide perfect conditions for growing of grapes. The best dry Bulgarian red wines include Cabernet Sauvignon from Svishtov and Oriahovitsa. Fragrant Pelin from Osmar is made with 29 different herbs. Merlot from Stambolovo, Gamza from Novo Selo, Mavrud from Assenovgrad, and the red wines of Melnik, are also reknown. Chardonnay and Traminer from Veliki Preslav and the Euxinograd Chateau are the finest Bulgarian white wines. The sparkling wines of Liaskovets and Magura Cave are excellent.